2. 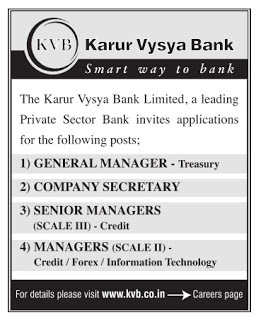 Assistant General Manager / Deputy General Manager (Company Secretary) - Any Degree with ACS + Minimum 10 years of experience as Company Secretary in Scheduled Commercial Bank(s) / Corporate organizations. Banking experience in Scheduled Commercial Bank(s) is preferable. 3. Senior Manager - Credit (Scale III) - Chartered Accountants/Cost Accountants/ Post Graduates preferably with CAIIB + Minimum 3 years of experience in Scale II Cadre handling Credit in Credit Department in any of the Scheduled Commercial Banks.